I'm actually a little late getting into the swing of things again. I finished my first book for the 2016 PopSugar Reading Challenge last week. The first book I finished is being listed as satisfying the 34th category - a book from the library. I kind of feel like that's cheating, as I get a vast majority of my books from the library. But that's the first category I came across on the list where this book fit. 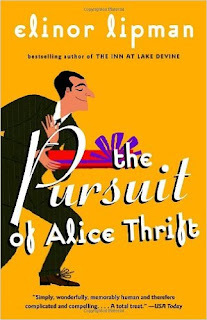 The Pursuit of Alice Thrift by Elinor Lipman was a very entertaining book. It's about a very intelligent intern, Dr. Alice Thrift, who is more than a little bit lacking in social grace and good judgment of people. When a man decides to woo our endearing Dr Swift, she really doesn't know what she's in for. The characters were very engaging and quirky, and they do thankfully fall into a happy ending. I almost wish there was another book to follow-up. I will look again at other books by this author to see if something else appeals to me, as I enjoyed her writing style. This sounds like it is a good read. Interesting premise. Sounds like a fun read. I love books with quirky personalities. It always make for a fun unpredictable storyline. This sounds like a book I would enjoy! Thanks for sharing. Seems like a fun book. I love quirky characters. They're so interesting. I love quirky characters! I really should utilize my library more... they are such great resources. Sounds like a great book with some very fun characters! Thanks for sharing this! Sounds like a good read. Might try reading this sooN! It sounds like a book that I would like. Still plowing on the Martian. Sounds like an interesting book, maybe I will add that to my book list to read for this year. I have a lot of books I am already reading. I am a slow reader to which doesn't help.